When students are learning to drive, we as parents give them plenty of driving tips. But how often do we talk to them about winter dangers associated with driving? Discuss the current weather conditions– is there a lot of wind, blowing and drifting snow, ice, black ice, white-out conditions? 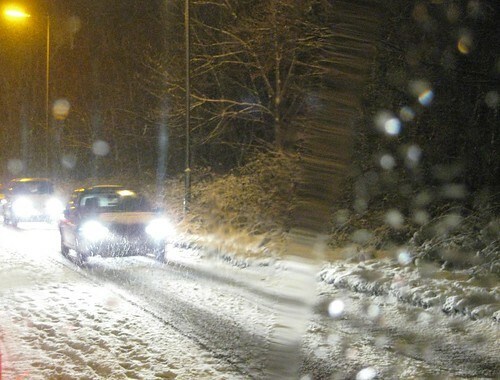 Is it really necessary that your student be driving and if so, remind them how to drive in those conditions. Don’t ever be afraid to tell your student that they can’t go out and drive if the road conditions are severe- be mindful that their safety is the most important thing, as well as the safety of others on the road. You may be very confident of your teens’ driving ability, but others on the road may not be as careful. Make sure they warm up their vehicle and that they have at least a half tank of fuel. Driving a vehicle on less than ¼ tank of fuel can lead to running out of gas or frozen fuel lines. Also, the windows should be completely free of snow, ice and frost. Headlights, tail lights and the license plate should also be clear of snow. The roof of the car should be cleared so that all the snow doesn’t blow onto the windshield and cause lack of visibility while they are driving. Ask them their intended route and destination. Encourage them to drive well traveled roads so that if they break down, their vehicle can be easily found. Make sure their cell phone is charged and they know who to call in case of an emergency. It is a good idea to input the phone number of a reliable towing service into their cell phone in case of emergency. Remember: cell phone use while driving may be hands-free only by an Illinois law that began 1/1/14. They should pull over to a safe location before making a phone call or texting. How warmly is your student dressed for the weather? Most teenagers dress for comfort- sweats or yoga’s , a hoodie and tennis shoes. Not the ideal outfit for walking in winter weather if they are stranded! At the very least, have them put a winter coat (the one you bought that they never wear! ), hat and gloves in the trunk or back seat- JUST IN CASE! Do you have an extra set of keys for the vehicle your student will be driving? Believe me, kids lock their keys in their cars more than you think! Your teen will not like the questions and extra preparation- TOO BAD. You are the parent and it is a privilege for them to drive at all. They will not understand the worry a parent goes through until he/she has children. Just ignore their complaints and tell them that you love them and you just want them to get there safely! I find it best to lead by example. Try to take the opportunity to teach good winter driving habits when your teen is riding with you. Make sure that your vehicle has plenty of fuel, working lights and turn signals and is in good overall condition. All snow should be removed to allow for a clear view of the road and other vehicles. Leave plenty of distance between you and the vehicle in front of you. Take your time around corners- your vehicle may slide on ice you cannot see. Slow down when approaching “S” curves, stay in your lane. Drive within the speed limit, but not too slowly either. Always use your turn signals and come to a complete stop at stop signs. If your vehicle starts to slide and has ABS braking system, apply brakes firmly, but do not “pump” the brakes. Good preparation and using common sense can lead to a very positive winter driving experience for you and your teen driver. It is always a good time to tell your student what you expect from them when they are driving. It is a responsibility and a privilege that should not be taken lightly.